In hospitals, patients who experience bad fall are and are recovering are given bright yellow bracelet on their wrists that says: “FALL RISK”. This bracelet means that hospital personnel need to take extra care of those patients as they are prone to being out-balanced. They might be unsteady on their feet so they need assistance from going one place to another. In the bible, we are reminded of the potential to fall into sin. We live in an imperfect world, the only place where there’s sin is in heaven. So while we’re still here, we are exposed to sinning. Satan is working hard at trying to tempt us so we can fall in to sin, either by the way we think, the way we speak or the way we do. If we look around us, there are many things that Satan can use to tempt us. It’s easy to trick ourselves that we’re standing firm from all the temptations and say that we’ve overcome sin. 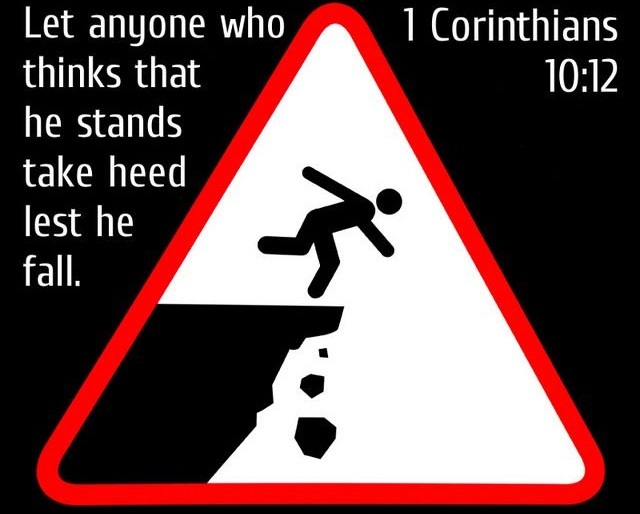 This is why the bible reminds us, “If you think you are standing firm, be careful that you don’t fall!” (1 Corinthians 10:12). I myself am prone to sinning, which is why it’s very important to ask for God’s guidance and protection in everything that we do. Last night Lemuel and I we meditate also about sinning, ingon sya hapit na jud daw ang rapture kay ang mga tao karon nagkaworst, pasalamat lang jud daw sya nga Kristohanon sya kay example layo sya sa barko daghan kaayo ug temptation mao pay muduol nimo pero one thing nga iyanag gihuna-huna Kristohanon sya. Pasalamat ta sa Ginoo nga Kristohanon jud atong nabana, lalo na malayo sila sa atin. "Overcome evil with good"
We all fall. Given. But that doesn't mean I am justifying by saying we all do. The key is to continuously learn and affirm moral values. What use is it if people would go to church and read the bible and yet do something outside of church? As always, a great reminder from you. There's always evil in this world. And sometimes, we can't protect ourselves from them and give in. But given a clear conscience, I think no matter what temptation it is, we confidently decline. I'm not religious. But yes, this world is in imperfect. There are many dangers, flaws. Everyone has to look out for others and him/herself. To keep each other save. And to care about each other. It's not the act of "falling" that matters the most but it's about how you bounce back or get away from it. It's a great reminder that the Lord is ever present even in our darkest days. Sinning in this world that's full of temptation is quite inevitable. We are humans and we react to what is happening around us. God has been there to always, always forgive us, no matter what. Thanks! That's true. Not just because you go to church doesn't mean you're perfect. That's right! There's always evil in this world because this world is owned by the devil. You're right there are times we can't avoid sinning, but there are also instances that we can resist them. Correct, sis! There's always evil in this world because this world is owned by the devil. You're right there are times we can't avoid sinning, but there are also instances that we can resist them. Right! As what the bible says, "grace is always greater that our sins", but it also says, grace shouldn't be an excuse to continue sinning. There are instances that we can resist sinning, altho others can't be avoided as well. I love the principle behind the standing firm. Truly, we should keep our balance so we might not fall. Just with our personal relationship with the Lord and also of our own dealings with self. I like how you take one Bible verse and expand on your thinking about that one line. My grandfather is a minister so he is much better at doing that than I am. But after we went to church he used to have me discuss the lesson of the day with him and it was good intellectual practice for me. I also didn't know about the fall bracelet! Interesting! I recently just found out about that too! My father is also a minister which could be why I got exposed to expounding verses at an early age. I couldn't agree more. Whenever I am making a decision, I always ask God of His guidance. Sometimes, without His blessings, we end up taking wrong turns. I just hope that each of us will take time to always think not just twice but a lot of times before making a decision that they won't regret in the end. I agree! Sins and temptations are everywhere and Satan will never stop to drag us all into these sinful acts.. but with our faith, God will lift us from falling and He will show us the way to escape such nightmare.. we're just humans and we are most of the time weak but God is so good that He gave us the chance to repent and be forgiven! That's true Zwitsy! Keep it up!